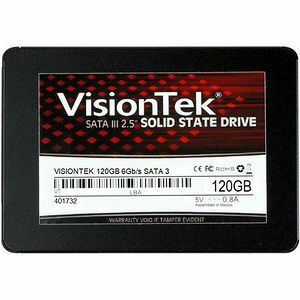 When your definition of high-performance means both speed and reliability, the VisionTek Pro 7mm SATA III Internal 2.5" SSD is the primary drive upgrade solution for every machine from the latest ultra-thin laptop to a desktop workhorse. Fast: Access time up to 50x faster than HDD. Flexible: Designed to deliver SATA 6G speeds, yet backward compatible to SATA 3G and 1.5G. Because it features a Silicon Motion Controller and tier one high-performance NAND flash, the VisionTek Pro 7mm 2.5" SSDs are designed to deliver top speeds with the files you utilize daily...videos, mp3s, graphics files, and zip files. While these files are compressed, the SSD controller doesn't slow down while processing them like other controllers do.